How Do I Integrate a Campaign's Google Analytics to My Dashboard? To get the most out of your campaign, SEOReseller.com allows you to integrate Google Analytics with each campaign in your Dashboard. There are two ways to integrate Google Analytics with your campaigns: The first is from each campaign. The second is from your main integrations feature. We'll start with integrating Google Analytics from the main integrations. 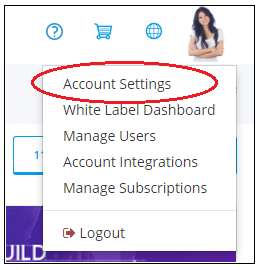 Hover over your avatar in the upper right-hand corner of your Dashboard and click Account Settings. 2. From Account Settings click Integrations. 3. From the Integrations page, click the Authorize Account drop-down and choose Google Analytics. 4. Clicking Google Analytics will open a pop-up window. 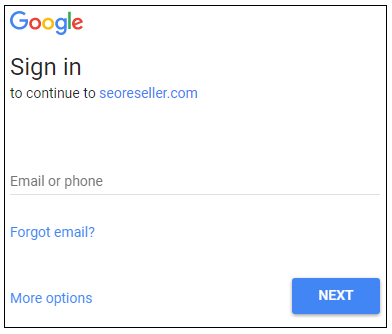 Enter the credentials for the Google Analytics account you want to integrate and click Allow to give your SEOReseller Dashboard access. This way is the recommended way to integrate Google Analytics. 3. In the Google Analytics section, click Manage. 4. If you added a Google Analytics account from the main integrations page, you can select it from the Select an Existing Account drop-down. 5. Then select the profile from the Select an Existing Profile drop-down and click Save Changes. 6. If the Google Analytics account has not been added, click Add New Account to authorize the Google Analytics account. On the Menu, click on Analytics and you should see the analytics data synced with your Dashboard. It's best to have one central Google Account where you ask your clients to share Google Analytics and Google Search Console. Having this central account makes it easier for you to integrate accounts and stay organized. Once you have this central account, don't forget to share it with your point of contact with us, so we can monitor campaign performance better.